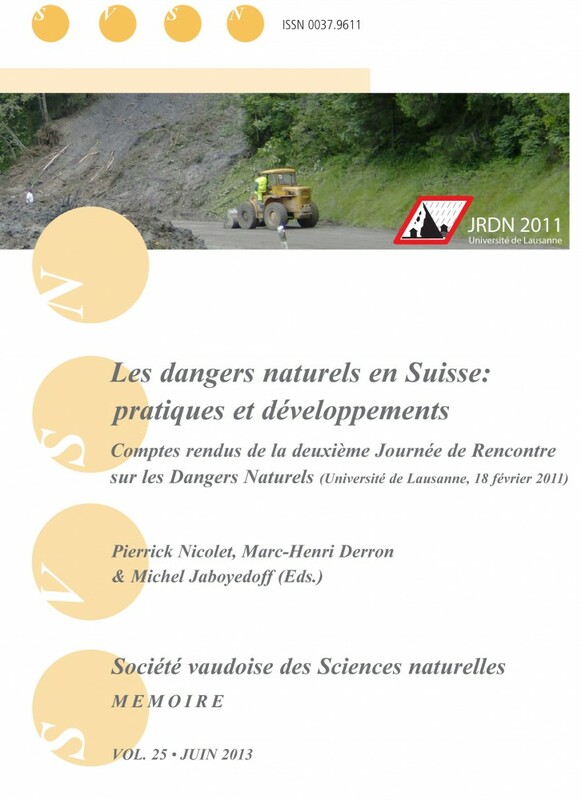 To celebrate the publication of a book on natural hazards in Switzerland, a conference entitled “Meteorites: from genesis to catastrophe” will be held at the University of Lausanne (Géopolis, room 1612) on the 12th of December at 18h. Everyone is welcome to attend the conference, wich will be given in French, as well as the apero that will follow. To facilitate the organization, please send an email to jrdn@unil.ch if you plan to attend the conference. This manuscript presents a review on the application of a remote sensing technique (terrestrial laser scanning, TLS) to a rock slope characterization and monitoring. Key insights into the use of TLS in rock slope investigations include: (a) the capability of remotely obtaining the orientation of slope discontinuities, which constitutes a great step forward in rock mechanics; (b) the possibility to monitor rock slopes which allows not only the accurate quantification of rockfall rates across wide areas but also the spatio-temporal modelling of rock slope deformation with an unprecedented level of detail. Further investigation on the development of new algorithms for point cloud filtering, segmentation, feature extraction, deformation tracking and change detection will significantly improve our understanding on how rock slopes behave and evolve. Perspectives include the use of new 3D sensing devices and the adaptation of techniques and methods recently developed in other disciplines as robotics and 3D computer-vision to rock slope instabilities research. More information and full paper on the ESPL website. We are happy to communicate the launch of our SNIS project website. It was developed by Stephanie Jaquet (PhD student at the University of Bern and member of the project), and contains information about our project description, goals and activities. Authors: Ivanna Penna and Michel Jaboyedoff. The CHANGES network was a Marie Curie Initial Training Network funded by the European Community’s 7th Framework Programme FP7/2007-2013 under Grant Agreement No. 263953. The overall strategy of the network was to bring together a group of researchers with diverse backgrounds, and disciplines. The network included 11 partner institutions hosting one or more researchers and 6 associate partners that co-supervised research projects, offered internships and participated in CHANGES network events. CHANGES intended to develop an advanced understanding of how global changes (environmental, climate change and socio-economical change) affect the temporal and spatial patterns of hydro-meteorological hazards and associated risks in Europe; how these changes can be assessed, modeled, and incorporated in sustainable risk management strategies, focusing on spatial planning, emergency preparedness and risk communication. Risk Analysis group of UNIL was involved in WP-4 of the project and hosted two Early Stage Researchers (ESRs) related to the development of an integrated web-based Decision Support System of how to use available risk information in risk reduction. The developed platform was based on open source software and technologies, and the stakeholders can analyze different risk scenarios, evaluate possible risk reduction alternatives and make appropriate decisions using Multi-Criteria Decision Making approaches with the support of other modules and resources provided by the different components of the project. For more detailed information, deliverables and publications, please refer to the CHANGES website. Large and small hazard events are already the main cause of mortality – second only to epidemics – for mountain populations in Nepal and a major impediment to rural development. Due to the dispersed nature of mountain hazards, especially landslides and flash floods, little attention has been paid by NGOs or government agencies to reducing such risks. Also, in parallel with the decentralization of power and budgets, new road construction is booming, often being undertaken by communities themselves who lack any technical knowledge. Bio-engineering measures, which are cost-effective and easily adapted to the local context, could significantly reduce landslides along roads but are rarely incorporated in road construction in Nepal. The project was undertaken in the Panchase region of Western Nepal. Selected communities are from three districts: Kaski, Parbat and Syangja district. For detailed information, please refer to EPIC’s website. Although the use of new remote sensing techniques, either terrestrial, aerial or satellite-based, is shedding light into how landslides behave and evolve, still many questions need to be solved regarding the treatment of these datasets, more specifically LiDAR point clouds and its application to a better modelling and forecasting of landslides in 4D (X,Y,Z and Time). Our research was focused on the development of new algorithms for the modeling and quantification of the geometrical variation of different failure mechanisms (e.g. toppling, falls, slides, etc) along time. The project was conceived through a threefold strategy: in a first step, we simulated mass movements at analog scale using a sandbox, in order to acquire high resolution 3D temporal data. Then, we exploited these datasets for the development of new algorithms aiming to better modelling and quantify the landslide geometrical variation along the different phases of the rupture. In the third and final step, we applied these algorithms to the study of more complex landslides in well instrumented pilot study areas, aiming to a better modelling and understanding of the 3D evolution suffered by complex mass movements during the pre-failure and failure stages. This project was conceived as the logical continuation of the one year FNS project 138015 “Understanding landslide precursory deformation from superficial 3D data”. The outputs of the project will improve future implementation of 3D remote sensing techniques in early warning systems, a great challenge in current risk management strategies. Funded by: Swiss National Science Foundation (SNSF). More detailed information can be found at the project’s website. The goal of this workshop is to contribute to identify emerging issues and linkages between sustainable development, global migration, climate change and disaster risk reduction together with UNIL-FGSE academic staff members, students and alumni, as well as specialist from abroad. A meeting among the swiss partners from the SNIS – Boliva Nepal project has taken place the 5 november at the University of Lausanne. Main findings of field work activities carried out in Nepal and Bolivia during the first year of the project and upcoming work for the second year were discussed among the group members. Identification of deep-seated gravitational slope deformation and structures displacements by advanced differential SAR Interferometry (PS and SBAS approaches). Rockfall hazard mapping: detection of source areas by quantitative DEM analysis (Loye et al 2009) and estimation of propagation zones by 3D numerical modeling. Debris Flow susceptibility mapping (source areas and propagation zones) by an energy-controlled numerical model (Horton et al., 2008). Snow avalanche susceptibility mapping (source areas and propagation zones) with Flow-R.
Field investigations along the road N7: detailed studies on identified hotspots by the regional mapping and the knowledge of the Geological Survey of Argentina. Baumann, V., Jaboyedoff, M, Oppikoffer, T, y Altobelli S. 2006. Potenciales caídas de rocas determinadas con el método Conefall para el área de Puente del Inca., S. IGRM-SEGEMAR y IGAR-FGSE. En Estudio Geocientífico aplicado al ordenamiento territorial en Puente del Inca, provincia de Mendoza, Argentina. SEGEMAR (Servicio Geológico y Minero Argentino) y MAP (Multinacional Andean Project), Anexo I, Buenos Aires. Baumann, V., Wick E., Derron M.H., Horton P., Jaboyedoff M., Rosas M. y Marengo H., 2011. Cartografía de la susceptibilidad a las avalanchas de nieve a lo largo de la ruta nacional 7 En: Actas del XVIII Congreso Geológico Argentino (Eds. Leanza, Franchini, Impiccini, Pettinari, Sigismondi, Pons y Tunik), p. 345. Neuquén, Argentina. Baumann, V., Wick, E., Horton P. y M. Jaboyedoff, 2011. Debris flow susceptibility mapping at a regional scale along the National Road N7, Argentina. Pan-Am CGS Geotechnical Conference 2011, Toronto. Wick, E., Baumann, V. and Jaboyedoff, M., 2010. Brief Communication: Report on the impact of the 27 February 2010 earthquake (Chile, Mw 8.8) on rockfalls at far distance, Natural Hazards and Earth System Sciences, 10: 1989-1993. Wick, E., Baumann, V., Favre-Bulle, G.,Jaboyedoff, M., Loye, A., Marengo, H., and Rosas, M. 2010. Flujos de detritos recientes en la Cordillera Frontal de Mendoza: un ejemplo de riesgo natural en la Ruta 7. Revista de la Asociación Geológica Argentina. Baumann, V., Favre-Bulle, G., Oppikofer, T. , Altobelli, S., Rosas, M. , Jaboyedoff, M. , Hermanns, R. , Coppolecchia, M. , y Fauqué, L., 2008. Estudio de las caídas de rocas sobre la ruta Nacional N°7, en las áreas de Polvaredas y Puente del inca (Mendoza) usando un modelo digital del terreno. In: Zappettini et al. (eds) XVII Congreso Geológico Argentino – Acta, Tomo I, p. 259-260. The project is funded by the Group Risk from the CRET Institute (University of Lausanne). 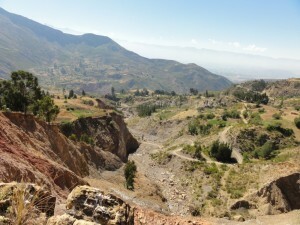 This project was carried out at the University of Lausanne, in collaboration with: University of Bern-Centre for Development and environment; University of Neuchatel-Institute of Geography; International Union for Conservation of Nature; South Asia Regional Coordination Office-National Centre of Competence in Research; Helvetas Swiss Intercooperation; and Agroecología Universidad de Cochabamba. In addition to poverty, food security and unsustainable land management practices, climate change and extreme hazard events are expected to place additional strains on the sustainable management of natural resources. Migration from mountain areas is already on the rise leaving behind women, children and elderly to deal with adapting to changing climate conditions alongside managing daily life: agricultural practices, maintaining terraces, irrigation canals, stabilizing slopes, etc. Although many studies have focused on migration from mountains to urban areas, few studies have analyzed the consequences of changing mountain demographics on land management. Unsustainable livelihood strategies and land use management can, in turn, reduce access to resources, increase environmental degradation and intensification of hazard events, especially in fragile environments such as mountains. The concept of Sustainable Land Management (SLM) is the most promising response to land degradation that has emerged in the past two decades. It addresses technical and ecological aspects as well as economic and socio-cultural dimensions. Effective and sustainable natural resource management depends on suitable technologies and associated implementation approaches, and on flexibility and responsiveness to changing complex ecological and socio-economic environments. This project focuses on the issues related to the “left behinds” and those “half-families” who either choose or are forced to stay in their place of origin, and how to make livelihoods options more sustainable and resilient. The goal is to explore the interface between people and mountain dynamics under a context of climate change in order to develop policy recommendations for land management and livelihood strategies, disaster risk reduction and implementation of climate adaptation plans. This trans-disciplinary approach which combines social and physical sciences, will address the following questions: How is land management in mountains being affected by three main factors: migration, climate change (temperature and rainfall patterns) and hazard events. How to increase the resilience of mountain populations facing such issues? Which measures are needed to increase the resilience of livelihoods and land management practices? For this comparative study, two pilot areas (Quillacollo District, Cochabamba department) in Bolivia and Nepal (Dhankuta District) were selected. 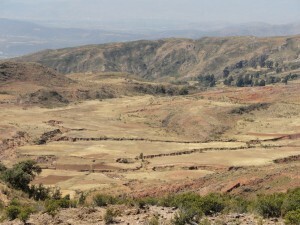 The results of our study will be used to develop practical tools for guiding decisions on promising sustainable land management practices for local land management experts, disaster risk and water managers, local NGOs and policy makers in order to effectively support female-headed households and other land users and finally lead to more sustainable livelihood outcomes. Funded by: Swiss Network for International Studies (SNIS).